Its a great time to be a student. You have access to an incredible amount of information. 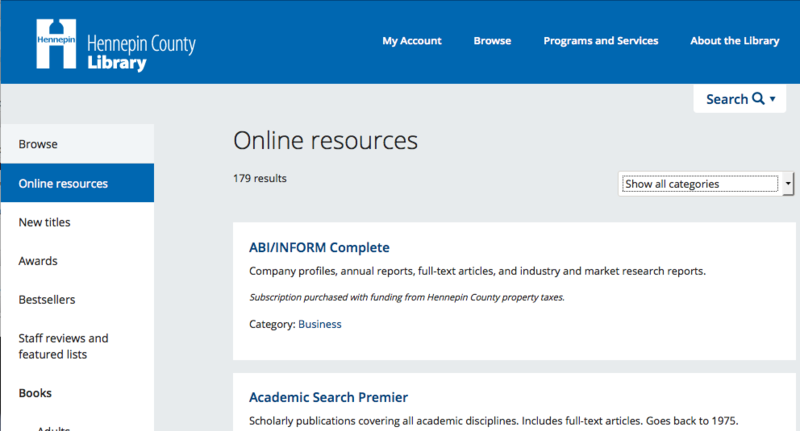 The databases linked here are a combination of Anoka Hennepin subscriptions and Electronic Library for Minnesota (ELM) provided. A few helpful websites are also included. It is very important to cite your sources(give credit for others work). Most databases provide a citation that you can copy and paste. The Citation Locator linked here will help you locate the citation. When specific assignments come up your teacher will ask to have selected tools from this list be placed in a LibGuide. Too many database choices and too much information can be overwhelming. A LibGuides helps to narrow the search for information. Digitized images from the American Antiquarian Society of the pages of American magazines and journals published between 1684 and 1912.
International journals covering complementary, holistic, and integrated approaches to health care and wellness. Catalog of Art Museum Images Online. Access Hennepin County's Cloud Library ebook collection. A HCLIB card number will be needed for access. Under Browse select the Kids or Teens groupings. Download the appropriate app to your device. Popular and professionally written information for patients and consumers covering all health-related topics from mainstream medicine to the many perspectives of complementary, holistic, and integrated medicine. Includes the Health Source database. History and culture of countries, states and territories; in-depth reports, glossary, maps, stats, and recipes. The Digital Public Library of America brings together the rich collections of America's libraries, archives, and museums. View videos and pictures online, download, or embed in a project. Use your computer login and password. Books about Minnesota and books written by Minnesotans. The History category has a wealth of information about Minnesota. All-purpose and subject-specific encyclopedias for middle and high school as well as multimedia. Includes MasterFILE Premier, Academic Search Premier, Business Source Premier, and Regional Business News databases. Contains elementary school-appropriate magazines, encyclopedias, dictionaries, and images. Includes Primary Search and Middle Search Plus databases. Full text of popular magazine and scholarly journal articles covering all subject areas including multimedia, primary source documents, and reference books. Includes Academic Search Premier, Business Source Premier, MasterFILE Premier, Consumer Health Complete, Health Source - Consumer Edition, and Science Reference Center databases. Contains middle and high school-appropriate magazine, journal, and encyclopedia articles and also includes primary source documents, reference books, and multimedia. Includes Middle Search Plus, MAS Ultra - School Edition, Consumer Health Complete, Health Source - Consumer Edition, and Science Reference Center databases. Collection of 25 online reference books and encyclopedias covering topics from Art to History to Medicine. Newspaper articles from hundreds of papers including the Minneapolis Star Tribune, St. Paul Pioneer Press, Sioux Falls Argus Leader, St. Cloud Times, Wall Street Journal, Washington Post, The New York Times, Los Angeles Times, Barron's, USA Today, and many more. Access to medical, statistical, health and related information; latest news. Contains full-text and article images from the Minneapolis Tribune (1867-1908) and the Minneapolis Morning Tribune (1909-1922). Software and tech tool training. Periódicos populares y diarios de habla hispana y bilingües, incluyendo el periódico en español El Nuevo Herald. Search resources connected to Minnesota. Nine different database collections. Valuable records are preserved in the National Archives and are available to you, whether you want to see if they contain clues about your family's history or are researching an historical topic that interests you. Social issues; articles, topic overviews, statistics, primary documents, links to websites, full-text magazines, newspaper articles. ebook, audiobook, and videos streamed to your device using Overdrive or the Libby app. HCLIB card needed for access. Pro vs. con essays that present multiple sides of current or controversial issues. Plus magazine and newspaper articles, primary sources, and more related to those issues. Promoting critical thinking, education, and informed citizenship by presenting controversial issues in a straightforward, nonpartisan, primarily pro-con format. A middle school-appropriate database of reference works, biographies, magazine and journal articles, primary source documents, and multimedia. Includes Discovering Collection, Junior Reference Collection, and InfoTrac Junior Edition databases. Research database on leading issues, natural disasters, terrorism, today's news, map of the world, World Almanac. Works well for pro v con. Encyclopedia, magazine, and journal articles, plus primary sources, images, video, and more for middle and high school students. TeachingBooks.net is an easy-to-use website that adds a multimedia dimension to the reading experiences of children's and young adult books. Our online database is developed and maintained to include thousands of resources about fiction and nonfiction books used in the K–12 environment. Providing a complete overview of U.S. history that covers the most-studied events, issues and current information, it combines documents from Primary Source Microfilm’s™ digital archives; articles from classic Macmillan Reference USA™ and Charles Scribner’s Sons® references; as well as other Gale proprietary content such as country and era overview information, and full-text periodicals and journals. 400,000 digitized materials from over 1000 libraries and archives across the country making African American History more broadly accessible. Government made easy: federal, state, local, and tribal. A great starting point for any information quest/search. Click Student to get started. Advanced has additional content and many additional features. Catalog of books and other materials held in libraries worldwide. If it exists it will show up here. Provides the info needed for manual cataloging of materials. Unlike other sources that only offer periodical or bibliographic information, World History in Context offers students and researchers unparalleled access to a broad collection of scholarly analysis and award-winning full-text periodicals, reference works and primary documents. World History in Context moves chronologically over 5,000 years from antiquity to the present and geographically around the globe, to ensure that the events, movements and individuals that defined, informed and shaped world history are covered with a sense of balance. Hennepin County Library provides access to an incredible selection of databases. A few of the titles are the same as ELM, Anoka Hennepin, and Anoka County but many are unique and purchased by the county. A Hennepin County Library Card is needed to access. After selecting a database you will be asked to enter your Hennepin County Library barcode number. Click the icon below to access the databases. Anoka County Library offers a nice selection of databases. A few of the titles are the same as in ELM, Anoka Hennepin, and Hennepin County Library. An Anoka County Library card barcode is needed for access. The State of Minnesota provides many databases free of charge to all Minnesota residents. No passwords are needed but users need to be within Minnesota's borders. There is a wide range of material available from encyclopedias, newspapers, magazine/journal articles, and MN specific. Nearly all of database here are linked in the Databse Access Links box to the left. Click the icon below and start researching.